Nowadays Internet has become the most important and entertained part of our life, Everybody uses internet not only in home but also in outside of the home like Bus station, College, School, Office and many more.... with the help of wifi (wireless fidelity). But what happens if there is no such a devices like wifi router to share an internet connection. As we all know Computer has a fast internet connection rather than mobile phones. 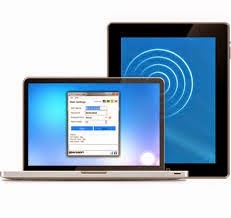 But today we are on the topic about to make your computer as a wifi hotspot or sharing fast internet connection from your computer to another wifi supportable devices like smart phones, tab, etc. This can easily solved with concept of Wireless Hosted Network was introduced in windows 7 from Microsoft windows. Now we are on the steps to make your computer as a wifi hotspot through command line with simple steps. First Run Command Prompt with administrative privilege. Now Type netsh wlan show drivers, You will see pic like this and check whether your computer supports hosted network or not, If yes, it supports else it doesn't. Now Type this command netsh wlan set hostednetwork mode=allow ssid=hotspotname key=password (You can change hostpotname and password with your own). Now at last, Type this command netsh wlan start hostednetwork then you will see pic like this. Now your computer is made as a wifi hotspot, but we still need to do simple and quick work for internet connection. Now go to control panel >> Network and sharing center. And click on the Active internet connection and go to properties and sharing tab and check the box "Allow other network users to connect through this computer's internet connection"and select the network connection name that is used by your hotspot. You can stop it by command line. Go to command line and type this command netsh wlan stop hostednetwork. Download the program from here. How to Change the Permalink On Blogger Post? How to Add an Alexa Ranking Widget in website or Blog? A Complete Blog Solution. Powered by Blogger.